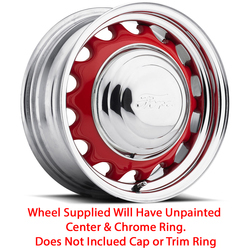 Wheel Vintique's Steel 17 Series Artillery bare wheels are available custom ordered in bare metal or powder coating color at extra cost. Available colors are Apple Green, Red Barron, Safety Orange, Gloss Black, Uni-Cream, White, Areo Yellow, Camel, Camaro Silver, Evergreen, Blue Streek II, and Primer. Factory lug nuts applicable. Accessories not included.